Joint venture partners, E.ON Climate & Renewables and Credit Suisse Energy Infrastructure Partners (CSEIP) place an order for 114 turbines, 104 x N149 and 10 x N131, as well as associated infrastructure works. Major ground-breaking order for turbines from the new DELTA4000 technology platform. Hamburg (renewablepress) - The Nordex Group has received its largest order to date for the N149/4.0-4.5 of its Delta4000 series and the company’s biggest order under which Nordex will also be delivering the civil and electrical balance of plant (BoP) works under an EPC contract. 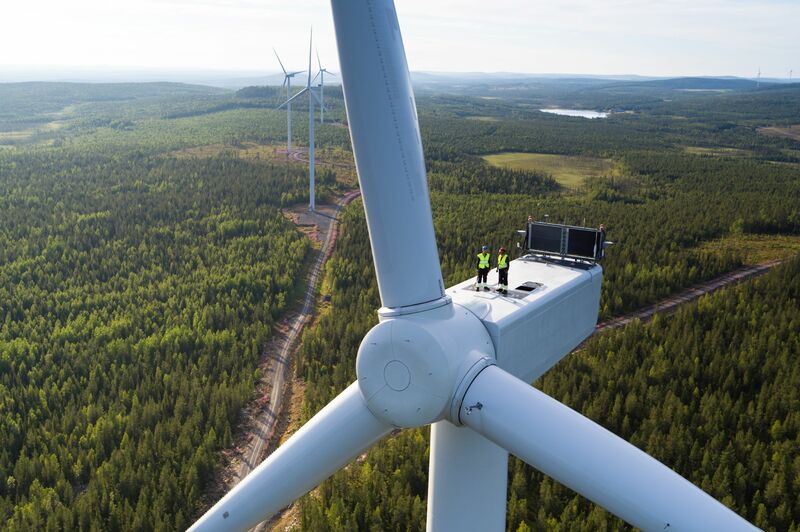 Credit Suisse Energy Infrastructure Partners (CSEIP) and Utility E.ON Climate & Renewables have ordered a total of 114 turbines from the Nordex Group for the “Nysäter” project in Sweden, which consists of two project sites in the Västernorrland region of Sweden, “Hästkullen” and “Björnlandhöjden”. Specifically, the order entails the delivery of 104 N149/4.0-4.5 turbines and ten N131/3900 turbines, with a mixture of tower heights. In addition, the Nordex Group has signed a two-year service contract for the turbines, as a contractor under E.ON’s long term management, operation and maintenance agreement for the project. “Nysäter is a lighthouse project in several respects. We see this major order as confirmation of the highly competiveness of our latest technology, the N149. The turbine passes the most extreme scrutiny and requirements of customers and financing banks in terms of bankability and technical and economic feasibility, and this in one of the most challenging markets in Europe. This deal also confirms our customers’ confidence in the Nordex Group and the capabilities of our team to deliver large and complex projects in challenging environment. I am particularly pleased that we are able to further expand our business with our long-standing partners“, says Patxi Landa, Chief Sales Officer of Nordex SE. The two project sites are characterized by mean wind speeds of between 7.5 and 8.0 metres per second. These are conditions for which the turbines selected have been especially designed for. Moreover, turbine operations will be configured flexibly, adapting to local conditions, in order to optimize energy yields. With regards to the N149/4.0-4.5 turbine, its potential is to meet a wide range of site-specific requirements with one hardware version. As the maximum output of the turbine varies between 4.0 and 4.5 MW, it is ideal for adapting to the grid operator's individual requirements, local wind conditions and noise constraints. Working closely with this flexible technology, the Nordex project optimization team has been able to exploit the full potential of each turbine position in order to get the very best out of the turbines on this particular site and to minimize the overall levelised cost of energy for the project. This optimization potential and ability to customize the turbine configuration, provides a huge advantage with large-scale projects like Nysäter, where typically the wind conditions and complex topography vary greatly across the site. The N149/4.0-4.5 will be operated between 4.0 MW and 4.380 MW, the N131/3900 between 3.13 MW and 3.9 MW resulting in a total installed capacity of 475 MW of the two wind farms known as “Nysäter” project. The balance of plant works, for which Nordex is also responsible as the EPC contractor, has already started at the wind farm. Turbine installation will start in March 2020 at Hästkullen and in May 2021 at Björnlandhöjden. The project is owned by a fund advised by Credit Suisse Energy Infrastructure Partners and E.ON Climate & Renewables. The Group has installed wind power capacity of more than 23 GW in over 25 markets, generating sales of around EUR 3.1 billion in 2017. It currently has roughly 5,000 employees. The production network comprises plants in Germany, Spain, Brazil, the United States and India. The product range primarily concentrates on onshore turbines in the 1.5 - 4.8 MW class addressing the requirements of land constrained as well as grid constrained markets. Please note: The emittent / publisher »Nordex SE« is responsible for all contents.